There is nothing better than to pack up the car and take a road trip. Sometimes that's not the easiest think for us to do. Lots of us including me require lots of time to plan a trip and make arrangements. 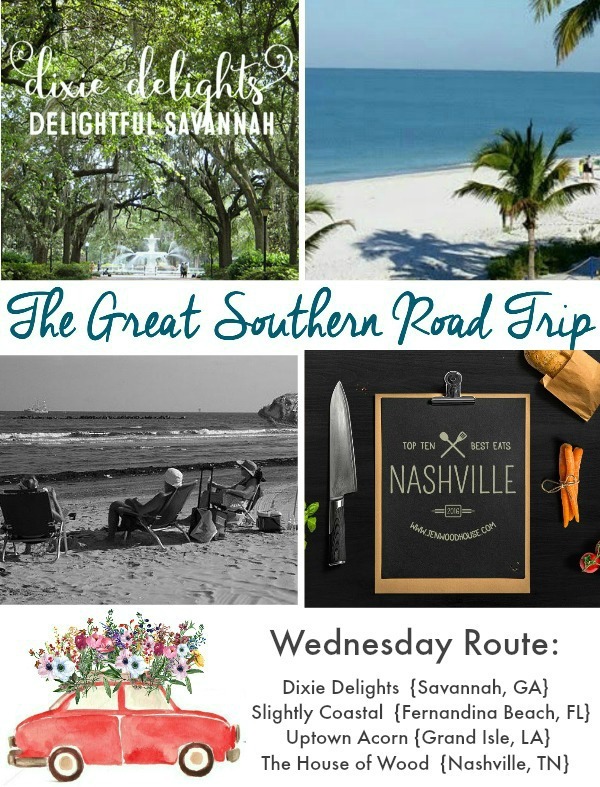 I loved it when Heather from Southern State of Mind asked me to be apart of a virtual Southern Road Trip! What fun! 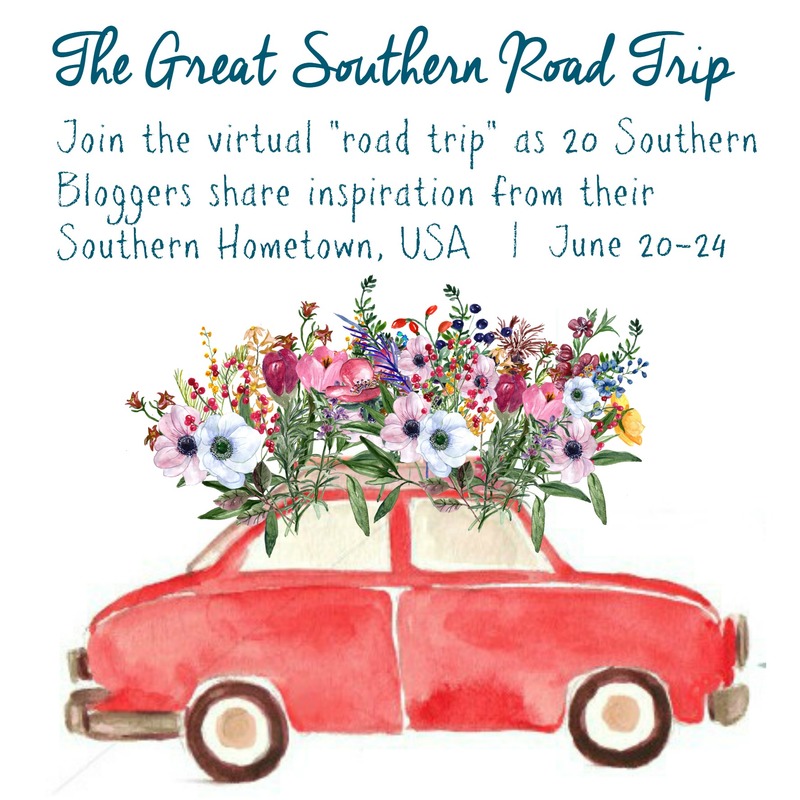 Heather invited a group of southern bloggers to share a bit of their southern roots with you. 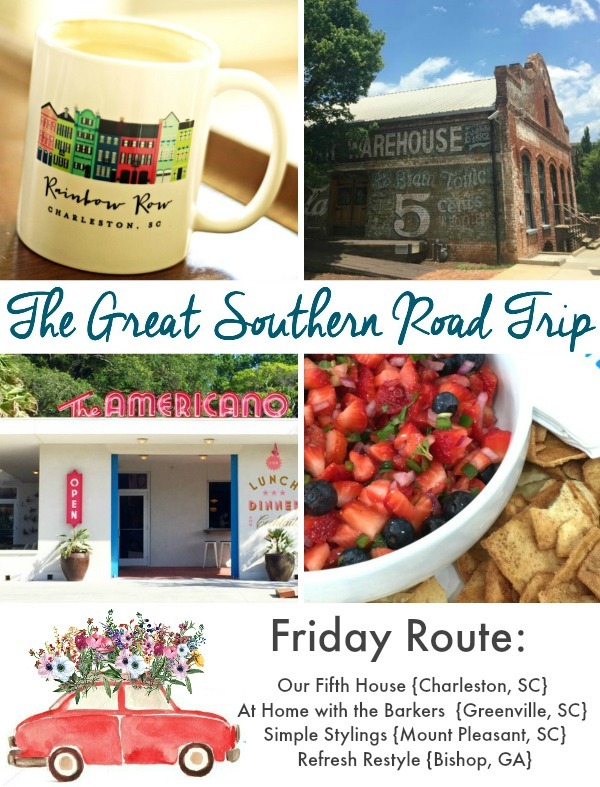 So get out your notebook and take a few notes from the tour of places you'd like to add to your vacation list! 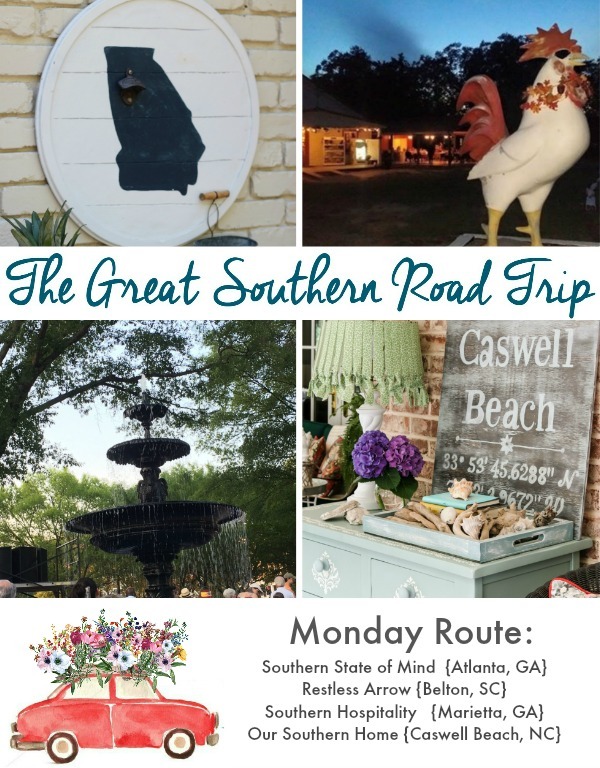 I live in the Upstate of South Carolina, but many of you know that I chose to spend much of the summer at our beach cottage in Caswell Beach, North Carolina and the area of Historic Southport. It's our home away from home. It's really the only beach our children care to visit. It's perfect in my opinion. It's on Oak Island and only one road in that dead ends at the NC Baptist Assembly grounds. You are either on the marsh or beach front. We are on the marsh. It's really wonderful. We host a large 4th of July party each year. Why?? The upper deck is the perfect spot to watch the fireworks in Southport. I know you've heard of Southport. Many television shows and movies are filmed there. Most recently the Nicholas Sparks movie Safe Haven was filmed there. My teen daughter and I dined on the deck of a local restaurant and watched filming for a couple of hours. I actually met another new friend there. We keep in touch on Facebook these days. She was taking a road trip with her daughter and fell in love with Southport. We even got to meet Josh Duhamel and Julianne Huff after the filming of the scene where she is buying paint at the store. You can see all of the pictures that I took from the filming divided into 2 posts HERE and HERE. This was the general store that was built for the movie and burnt down for the movie. It was really sad to see such a beauty burn down. We were with friends on their boat and got some great shots from the water when they were still under construction. Our hands down favorite restaurant is the Provision Company on the water in Southport. It's really a hole in the wall, but we eat here often. Here are the kiddos. Southport is a beautiful, small historic town. It oozes with charm. We never tire of strolling around looking at all of the homes in this sea town. There are lots of antique, thrift store and boutique shops. Dining spots are plentiful. It's only 45 minutes from Wilmington, NC and an hour above Myrtle Beach, SC. We go over the bridge from the island, and we are in Southport. You can see more of the Historic Homes of Southport in other posts. To celebrate our beach town, I decided to make a DIY Longitude and Latitude Sign. Simply visit this site to enter your destination. It will then give you the latitude and longitude. Precut 24×24 inch piece of plywood from your home improvement center. Hold the brush like this as you dry brush. This is with the first coat. With a couple of coats of white. Then do the same with just one coat of blue. Play around with fonts and design your sign. If you pick a square with the size wood, it will be perfect!!! Save your design to your computer as a jpeg. Upload your design to Blockposters.com. It will be free! When you print, it will be 3 sheets wide and 3 sheets long. Lay the design out. You will need to fold over edges and tape together. You will see what I mean when you print. It's so simple. Sit in a chair while you do this. I got comfy on the sofa with it in my lap and painted. This part isn't messy. Once dry, finish with a coat of the Soft-Touch Varnish mentioned above. It's perfect for indoors or a covered porch. You will notice that my letters look like they have a faint black outline. That's because I painted them dark at first and didn't like it. I then went over them with the blue. I love the look. Don't be afraid to experiment with colors on your sign. It's the perfect spot on our South Carolina porch to showcase our beach treasures. You can see more of the porch HERE. Those 2 little blobs are sand cast molds of the kid's feet from the beach many years ago. They are now 17 and 19. Don't ask me how I made those. LOL! It was way before the online age. I think it's something I saw in an issue of Family Fun magazine. I can't believe they haven't been broken. So sweet. Be sure to PIN the above image for later and share with friends! 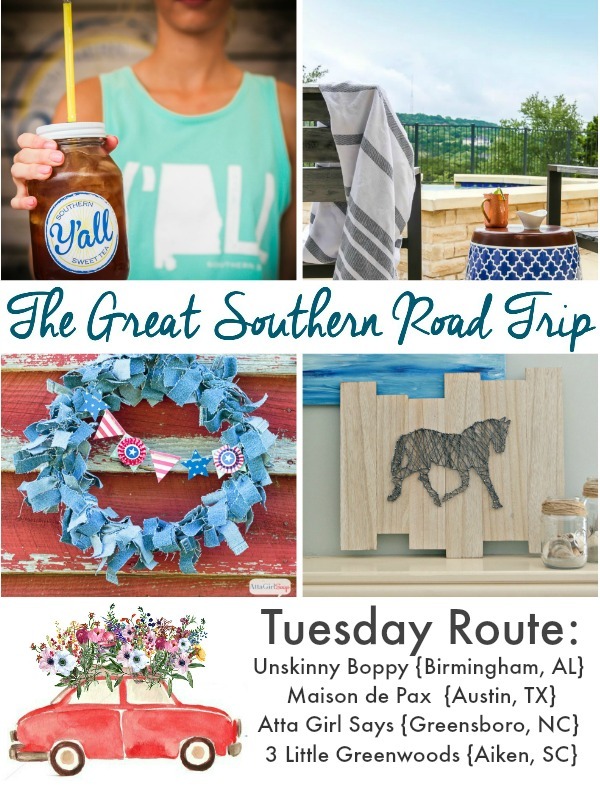 Let's visit the others on the Road Trip! I can't wait! I'll update the links each day so be sure to visit! I love your sign! Looks fabulous! What a sweet photo of your kids, they’re getting so big. My daughter is going to be a junior this year…it’s crazy! Hope you’re having a great summer. Happy 4th! I would love to know more about your spotlights for Caswell Beach and Southport (❤️ Cat on a Whisk!). 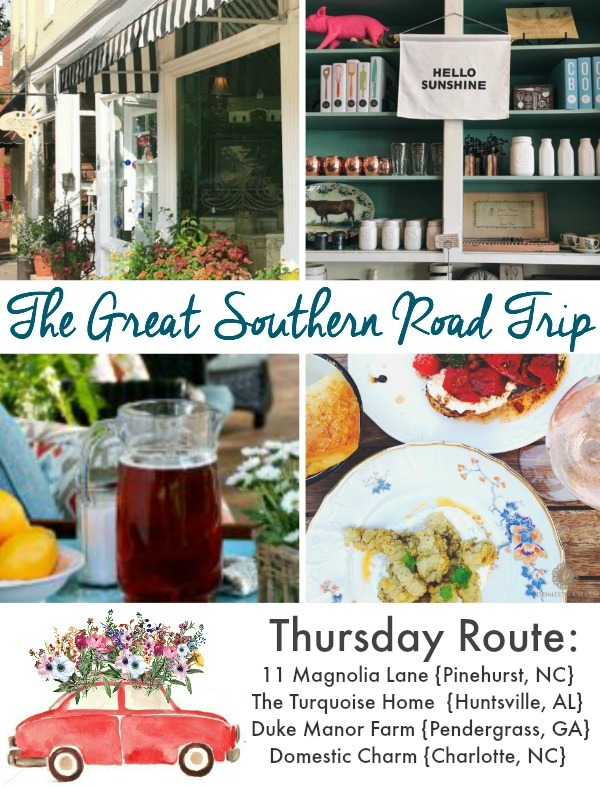 We go there with a church group every spring – much too early for the beach, but we do love to eat and shop! What a wonderful sign! Thanks for taking the Southern “road trip” with me. Thanks so much! Lots of fun! The sign is terrific. I will need to make one for my area. Thanks so much! It was a fun project. Have fun with it! The DIY Longitude and Latitude Sign is a great idea. We just moved to a new town in northern GA; I think a sign like yours would be great for our screen room. Thanks for sharing your favorite beach town. Lori Dorrington recently posted…Join the Fun…. Thanks so much, Lori! It’s perfect for a porch. Congrats on your recent move! Rhonda recently posted……Ahhh This Birdie Tray Is Just Right! I love your latitude and longitude sign! I always wondered how you find that for a particular location and now I know! Like you, I never tire of looking at those darling homes at Southport and the cute shops you find there. I can’t wait to see more photos this summer! What a great idea, Christy! We love Oak Island, too. Such a fun way to keep the beach in your mind when you have to be away. Thanks for sharing. Thanks so much!!! Heading there Monday….can’t wait! okay, love the sign, but love that sweet little beach town. I imagine if I lived on the coast it would be in a town just like that. your sign is too cute.I may have to make one! PS- Im ready for the beach anytime you are!